Conclave: The Politics, Personalities, and Process of the Next Papal Election, by John L. Allen, Jr. This article has been read and approved by one of the highest Roman Catholic authorities in England. The election of the Primate of Christendom has been fittingly termed the supreme administrative act of the Church, and is necessarily fenced around with elaborate and extraordinary precautions. When the Pope is attacked by grave illness and his condition becomes critical, his Secretary of State sends notice of the fact to the Senior Cardinal that he may at once come with his colleagues to the Vatican; and to the Cardinal-Vicar, who administers the diocese of Rome, that he may cause prayers to be offered in all the churches. 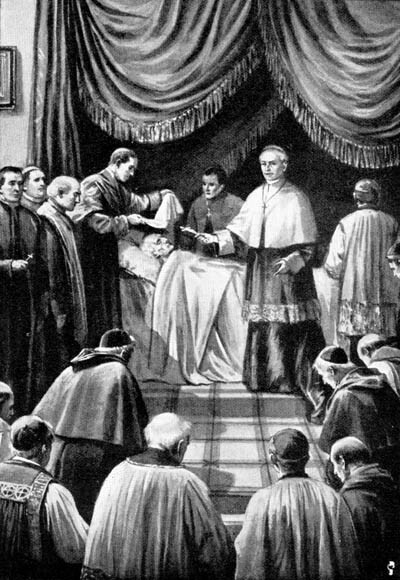 The Cardinals and the domestic prelates now gather round the bed of the dying Pontiff, who is assisted in his last moments by his confessor and the Cardinal Grand Penitentiary. The Bishop-Sacristan brings the Viaticum and administers Extreme Unction, after which the Cardinal Grand Penitentiary assists him to repeat the profession of faith and pronounces over him the last absolution. The commendatory prayers are now said by the Bishop-Sacristan. H.E. 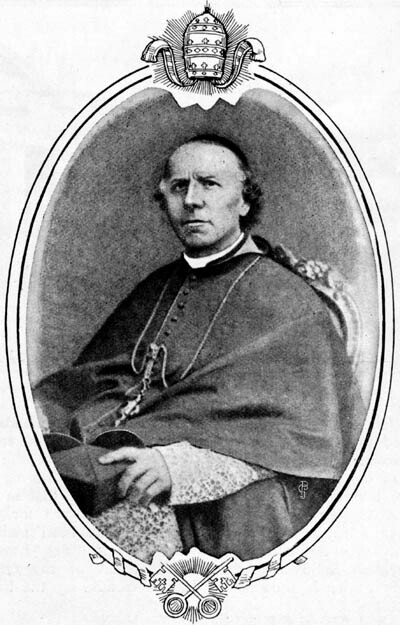 Cardinal Oreglia, Camerlengo of the Holy Roman Church, who is in charge of the Vatican during the vacancy of the Apostolic See. Upon the death of the Pope, the government of the Church devolves upon the College of Cardinals till such time as his successor is elected, and a small Executive Council undertakes the work of administration, the president being the Camerlengo, or Chamberlain, of the Holy Roman Church. This high official at once takes charge of the Vatican and then proceeds to verify the decease of the Pope. A medal struck by Pope Leo XIII, as Camerlengo, when the Holy See was vacant in 1878. Going with various prelates and other ecclesiastical dignitaries to the death chamber, he taps the brow of the deceased Pontiff three times with a small silver hammer, and thrice calls him by his Christian name. Receiving no reply, he turns to those present and announces, "The Pope is indeed dead!" He then takes possession of the Fisherman's ring, which has been removed from the Pope's finger, and subsequently breaks it in the presence of his fellow Cardinals, at the first meeting of the Sacred College. The Camerlengo, or Chamberlain, notifying the assembled Cardinals of the death of the Pope. The next days are occupied in the funeral ceremonies, which are of the most elaborate and stately character, and last about a week. The body of the deceased Pontiff lies in state in St. Peter's, where vast multitudes assemble to take a last look at the face of the Father of Christendom.